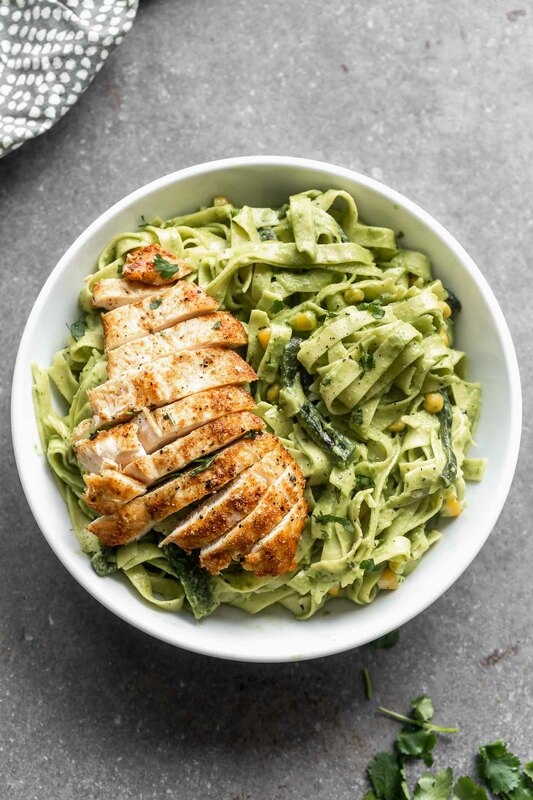 Creamy Roasted Poblano Pasta: Silky strands of tagliatelle pasta twirled in a smoky, spicy, DELICIOUS Poblano Cream Sauce. There’s also hints of cilantro and garlic – yum! Perfect for date night, Friday night, or really, any night. 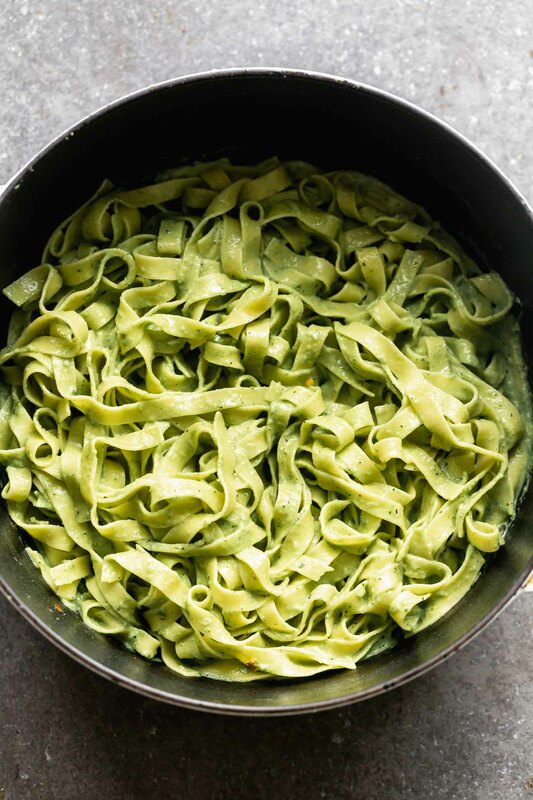 Valentine’s Day often comes along with boxes of chocolates, massive bouquets of red roses, and grand gestures, but if all my hubs presented me with was a giant bowl of this Roasted Poblano Pasta, I’d be one happy wife. He can’t cook, so we’ve come to an agreement. I’ll supply the pasta, he’ll supply the cliched arrangement of flowers from my favorite local shop. 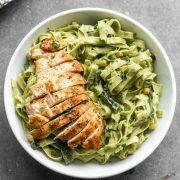 I know a date night dinner normally might include filet mignon, lobster, or something equally fancy, but silky strands of tagliatelle intertwined in a smoky, spicy, CREAMY sauce sounds pretty phenomenal to me. If you really want to step your game up a bit, you could actually swap out the seared chicken for a little bit of shrimp or lobster. And of course, this does’t just have to be served on V-Day, it’s perfect for a fancy Friday night in or Sunday dinner. The sauce is actually something I’ve been making for a few years now, and it. is. HEAVENLY. I love it when I’m looking for something creamy, but spicy, and a little outside the box. Here’s the thing. Sometimes poblano peppers have a bit of spice to them. Sometimes they don’t. The first time I made this pasta, the peppers were not nearly spicy enough for my taste. This is where the jalapeño comes in. What I like to do is roast all the peppers (poblanos and jalapeños), then taste the poblano peppers to see how spicy they are. If I feel like they need a little kick, I’ll add in a little bit of jalapeño. After blending the sauce, if I still think there needs to be a little more heat, I’ll add a little bit more. 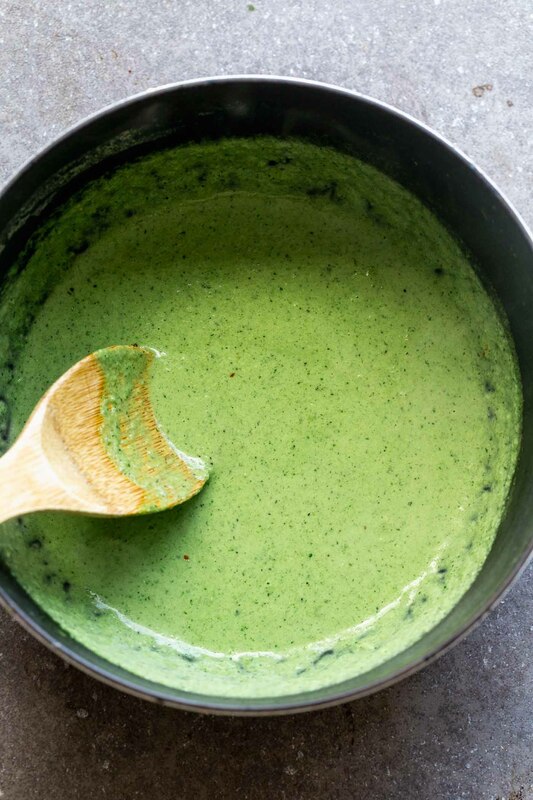 It’s really up to you, and remember, you can always add more spicy, but it’s hard to take away without adding more chicken stock or cream, and diluting the other flavors. 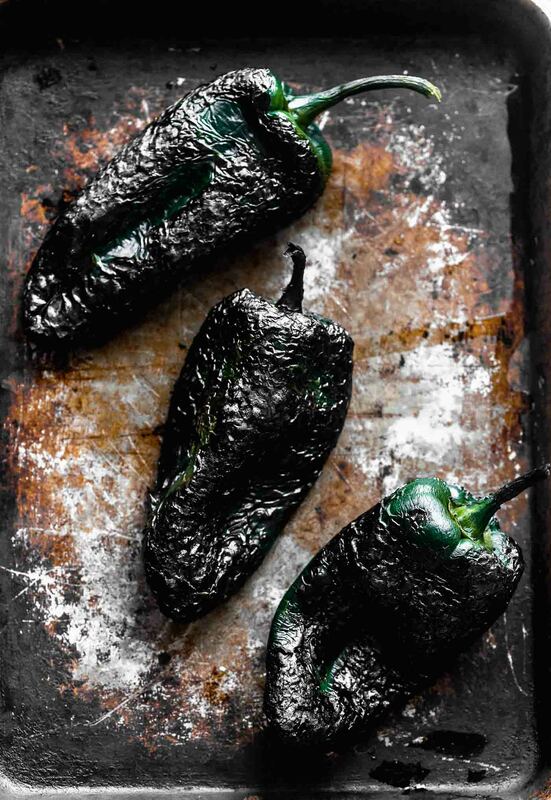 If you’re a frequent reader here, you’re probably well-versed in roasted poblanos since I’ve posted my fair share of recipes that include them. (This Slow Cooker Poblano and Honey Lime Chicken and this White Chicken Butternut and Poblano Chili are favorites.) If you’re not a frequent reader here, or you’re not familiar with roasted peppers in general, it’s the best way to cook them. Basically you char the peppers over an open gas flame or under the broiler, and trap all of that steam and heat in a bowl covered with plastic wrap. After a few minutes, the peppers cook and wilt down, making it super easy to peel the skin off. At this point, I love to chop them up and throw them in soups or tacos (see above), but here, they’re thrown into the blender with lots of cilantro, chicken stock, cream and a little bit of salt. Once the mixture is blended, it goes into the pot the pasta was cooked in, along with a little bit of garlic, and the rest of the cream. It’s simmered until the garlic cooks out, and then twirled with the tagliatelle. As always, make sure to save some of the starchy cooking water to thin out the sauce a bit. Season with salt and pepper. Serve! Char poblano peppers on all sides over a gas flame. If you don't have a gas stove, char them under the broiler. Once all of the pepper is charred, place in a bowl and cover with plastic wrap. Let them sit for 5 minutes. Peel skin off, take stem and seeds out. Season chicken on both sides with 1/2 teaspoon salt, a little bit of black pepper, and ground cumin. Set aside. While the peppers steam, bring large pot of water to a rolling boil. Season liberally with salt. Cook pasta until just shy of aldente, with fresh pasta this should only be about 3 minutes. Reserve about 1/2 to 3/4 cup of the starchy pasta water. Drain pasta. Set aside. While pasta cooks, add two peppers, cilantro, 1/2 cup chicken stock and 1/2 cup heavy cream to a blender. Blend until smooth. Slice third pepper into strips. 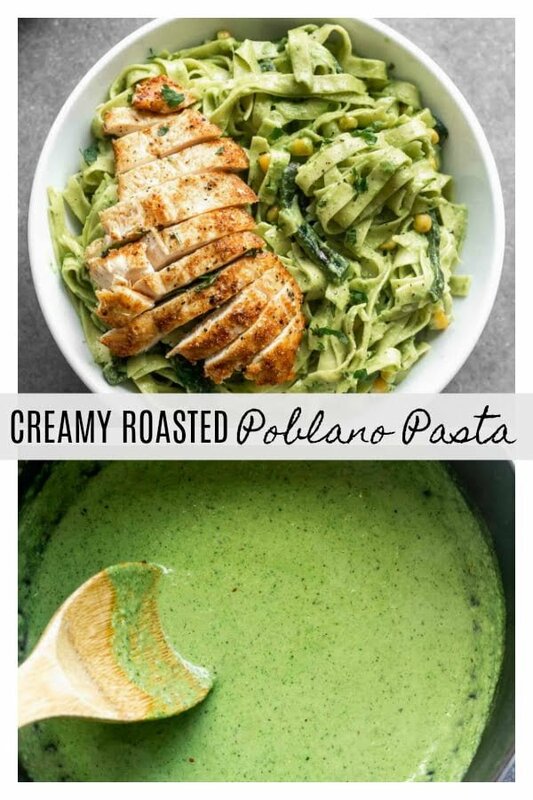 Once pasta is drained, add poblano cream sauce from the blender to the pot, along with remaining heavy cream, garlic, 1/2 teaspoon salt, and red pepper flakes. Bring to a boil and reduce to a simmer until slightly thickened, about 3 minutes. Add cooked pasta, sliced peppers, remaining 1/4 teaspoon salt, and corn. Toss until pasta has absorbed sauce. Season to taste with salt and pepper. Garnish with chopped cilantro. As the sauce cooks, heat a medium skillet to a medium heat. Add chicken. Cook 3-4 minutes per side until cooked through. 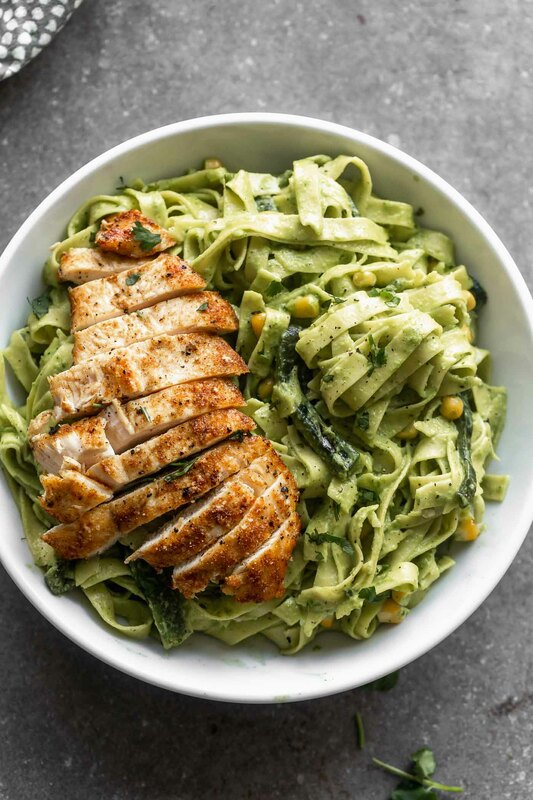 Sliced and serve on top of pasta.